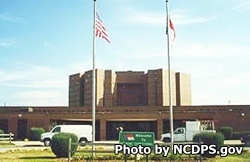 Piedmont Correctional Institution is located in Salisbury North Carolina, part of Rowan County. It is a minimum and medium security prison that houses 952 adult males. The prison consists of a several multi story buildings situated on 52 acres, including a six story tower that houses the inmates. Inmates are housed in multiple occupancy cell blocks. Inmates who are difficult to manage or have safety and security issues are housed in one of the 48 cells in the administrative segregation unit. An additional medical facility addresses health issues and an on-site dental clinic is also available to inmates. Piedmont Correctional Institution has a substance abuse treatment program called "New Direction" which is a 28 day intensive treatment for drug and alcohol addiction. Additional group meetings occur in the evenings to strengthen the commitment to sobriety. Vocational training in carpentry, computers, auto body repair and auto mechanics is offered to inmates. The Correctional Enterprise program runs an on-site reupholstering shop and other work opportunities include working in the kitchen and in facility maintenance. Visiting at Piedmont Correctional Institution is by appointment only. You must call and schedule your visit at least 7 to 14 days in advance Monday through Friday by contacting the visitation officer at (704)-797-4604 or (704)-797-4485. Visiting occurs on Mondays, Tuesdays, and Wednesdays from 8:30am-10:30am and from 1:30pm-3:30pm. You can also visit on Saturdays from 8am-9am, 1pm-2pm, 7:30pm-8:30pm. Security threat group and control status inmates have non-contact visitation on Thursdays from 9am-10am and 2pm-3pm.